I went for a walk along a undeveloped area near my hotel the other night and I noticed that there were a large number of hawks perched on the streetlights along my route. It was entertaining to watch these predators watch the fields for prey and then fly off to capture their dinner. However, on my return leg I noticed one specific hawk that sat regally on the pole and didn't seem to be worried about anything. Vehicles drove by under him, and amazingly, I could walk up to the pole and not disturb him. The picture to the right does not do him justice, but you can tell that I am pretty close. Unfortunately I only had my phone and the camera has a wide lens and makes it look further away that it really was. I was about 6 feet below and 4 feet out from the hawk. You can also see that he was busy scanning the fields and did not care at all that I was this close. I thought that perhaps the birds had been acclimated to human presence, but the other birds would not let me get within 50 yards of them and they would fly off to land at least that distance behind me on a different pole. 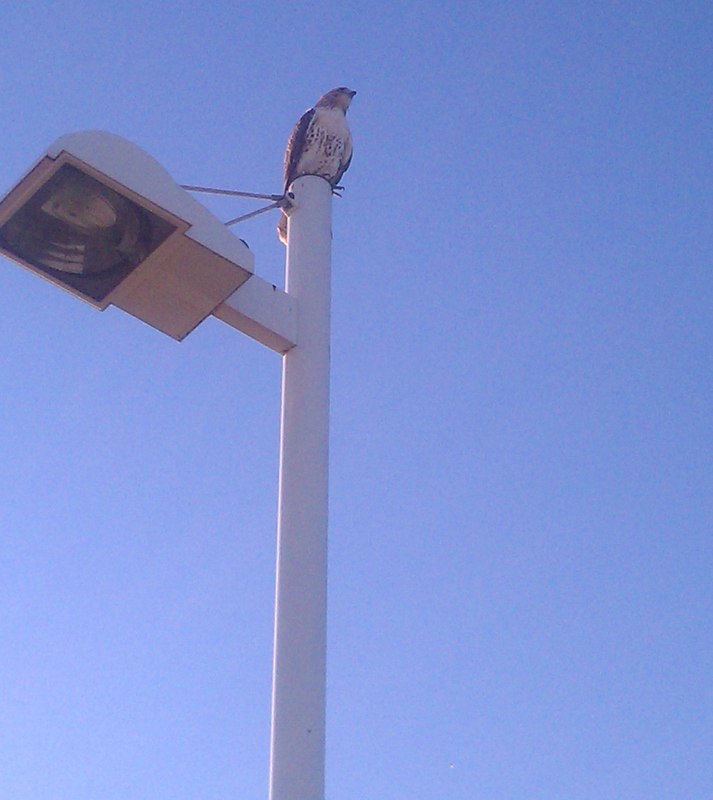 For me though, this one hawk really made my day with such a beautiful close-up experience.